As the life span of the materials used in construction is crucial to the environment, we can only praise the properties of stone, as a building material. Most of the buildings that survived through the millennia are made by some kind of stone. Some might say out of necessity or lack of other materials. Nevertheless, stone structures are the only ones that survived for thousands of years, so we can only admire the properties of this difficult to form, but everlasting material. The stone also helps keep the building insulated and comfortable to stay in. Massive amounts of masonry, in walls, approximately one meter thick, absorb the heat provided by the sun, transmitting it to the cooler interior, during the winter and the opposite during summer time. This form of ‘insulation’ provides an amazing thermal stability throughout the year, near or inside the comfort zone. Along with their storage capacity, stone walls provide amazing time-lag abilities. A 24 inch stone wall, can provide about 15.5 hours of time lag, meaning that it can delay the heat transmission from the exterior to the interior and vice versa, allowing the building to maintain its temperature through days, even seasons, resulting the stability of its micro-climate, all year long. A visit to the Cathedral’s roof, revealed a very impressive fact. 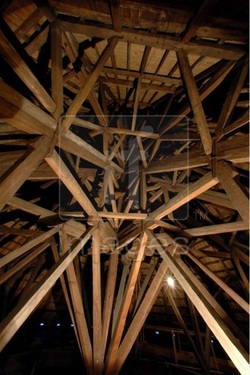 A massive amount of the original timber still stands, from 1022 AD, with minimal preservation. Even though timber is vulnerable to weather conditions or insects and bacteria, when used in conjunction with proper placement within the building envelope, ventilation and coating can go a long way in time. Along with modern chemical products, solid timber can be a material of choice, in contemporary architecture. Using the stimuli of the Cathedral, always considering the fact that forests worldwide are threatened with extinction, we can include timber in our projects in an effective manner in terms of a sustainable way of choosing a material that will last longer- therefore our building will not have to be demolished or rebuilt, resulting in the use of more materials.